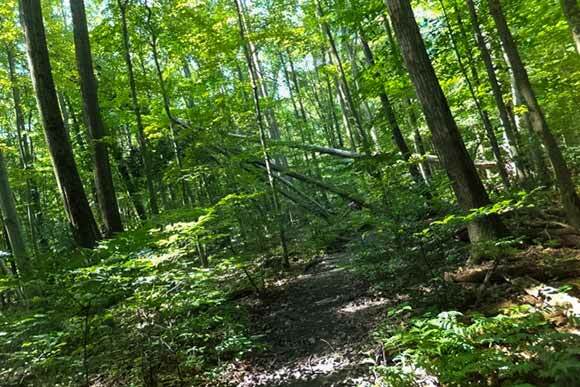 While many northeast Ohioans are familiar with the Metropark Reservation in their backyard, the Emerald Necklace is dotted with incredible assets begging to be explored by high adventurers, kids and grandparents alike. 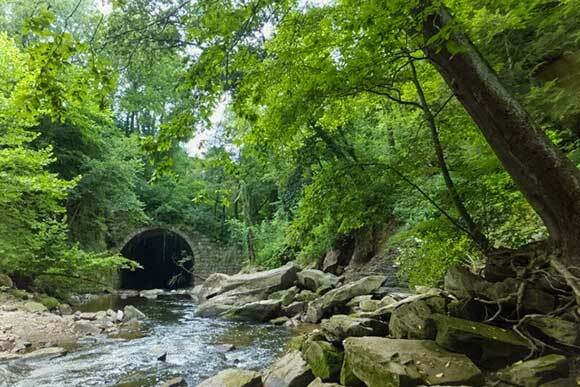 From an obstacle course amid the treetops to a 200-year-old cemetery, Fresh Water Cleveland has rounded up ten of the Metroparks' best hidden gems, quirky trails and thrilling courses. With five zip lines and 40 different treetop crossings and obstacles, the Go Ape! treetop adventure course in the Mill Stream Run Reservation ain't for sissies, but it is for just about everyone else. "It's geared toward everybody," says course manager Ben Holy, adding that an 84-year-old has attempted the course, which opened earlier this year. The minimum age is 10. The course features zip lines up to 600 feet long, Tarzan swings, platforms up to 50 feet high and intriguing obstacles such as the Spider's Web and the Stirrups. Adventurers navigate the course at their own pace (a training session is included in the admission price), but Holy says the average time is two to three hours. "It was a lot of work, but it pays off when you're flying through the zip lines," said Paulina Cazares just after finishing the course. "You're letting go and you're free and you're like: I did it! It's wonderful." Cazeres and Joel Bolanos of Rocky River were celebrating their 11th anniversary at the attraction. Although sustained 25 mph winds and lightning storms may close the course, rain does not. Bolanos and Cazeres both recommended gloves. Go Ape, which is adjacent to the Chalet and toboggan chutes in Strongsville, will be open for as long as Old Man Winter stays at bay. "We're shooting for Thanksgiving weekend," says Holy. "We'll operate until Mother Nature says, 'you can't do that.'" This feature in the South Chagrin Reservation is pure heaven for the tween set, with a challenging, uneven 0.6-mile trail that includes 67 stone steps going down to the Chagrin River. The path edges along the embankment, traverses stone and wooden bridges, winds around beautiful sandstone formations and gets mighty narrow in spots, but the payoff is big. This section of the Chagrin is a favorite for swimmers seeking respite from the late summer heat amid huge rocks and waterfalls: let the climbing, splashing and frolicking begin. In the middle of this natural playground sits Squaw Rock. Folk artist Henry Church committed the work to the massive chunk of sandstone in 1885. Some sources say the carving is a protest piece on behalf of the Native American population, while others claim it represents American progress. Interpretation notwithstanding, the work depicts a woman, a slithering snake, and a quiver of arrows among other things. Visitors are well advised to catch their breath while taking in the relief sculpture as the steep path back up the embankment has nearly twice as many stone steps as the one going down, 128 in all. 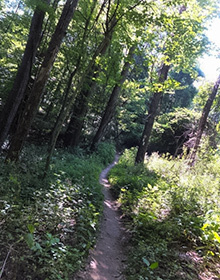 Snaking around the forests and meadows of the hilly Bedford Reservation is nearly ten miles of mountain bike trail. The ancillary all-purpose trails and connectors bring the total mileage to 11.5. All of it is a boon to area cycling enthusiasts. "You're going over large roots," says cyclist Tracy Evans Walker of Solon while taking a break from an arduous ride along the paths, all of which are connected and have names such as Touch Stone Loop, Parallel Universe and Mars Quarry. "You're going over rocks. You're going through streams. You're going up and down hills." "Some of the trails are very narrow," adds her fellow adventurer Dave Walker. "You go between trees." Much of the trail is in the woods, although it also traverses open areas and even a golf course. Elevations range from approximately 820 to 980 feet. Hikers share the trail, with those on foot going one way and on those on wheels going the other way, "So you can look out for each other," explains Evans-Walker, who describes the trail as intermediate. "It's great!" she reports over her shoulder before rolling back into the woods. Accessible via car or the paved all-purpose trail of Garfield Park Reservation, the 48-foot Mill Creek Falls (also known as Cataract Falls) is the tallest waterfall in Cuyahoga County. It's also in the heart of Slavic Village. 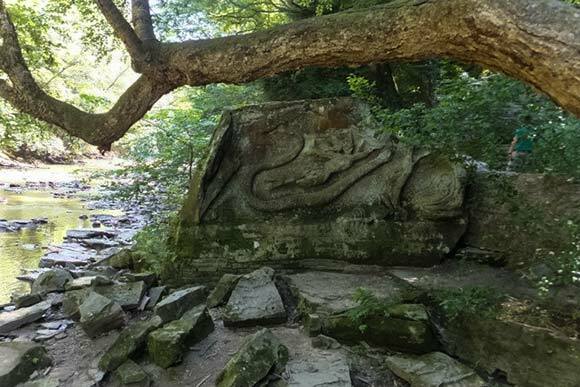 "I was always astonished by the sheer number of people who had no idea it was there, many of whom grew up in the same area," says Valerie Fetzer, a member of the Metroparks' Outdoor Experience staff and manager of the Rocky River Nature Center. The seasoned park employee has held a number of different positions within the organization since joining in 2001, one of which compelled her to conduct hikes to the falls from the Windy Ridge picnic area in Garfield Park. If explorers opt to walk that approximate 1.25-mile route, she adds, they'll be traversing some storied territory. "When you travel on that trail, you are passing through what was the campus of the Northern Ohio Lunatic Asylum," says Fetzer, noting that the unfortunate name was subsequently changed to the Cleveland Development Center among others. The facility, built in 1855, had a checkered history. Through all of it the falls have endured as they do today. Fetzer notes that the beautiful natural feature can be enjoyed year round. "It's worth a trip in every season," she says. This gentle 2.4-mile trail in the Big Creek Reservation will make you all but forget you're in the heart of suburbia. It connects Lake Isaac to Lake Abram, both of which were carved by glaciers. Features include a prehistoric play pit, boardwalks traversing stunning marshes, a 140-foot tunnel that goes under a railroad, public art and, just when you think you've left civilization altogether behind, an on-street section. You'll go by a residential stretch, a movie theatre and a host of retail locations. All of that is predictable enough, but what you will not expect is Hickcox Park, which is a tiny fenced area adjacent to the trail in a vast asphalt parking lot. It houses the graves of seven early Cuyahoga County settlers that date back to 1809. 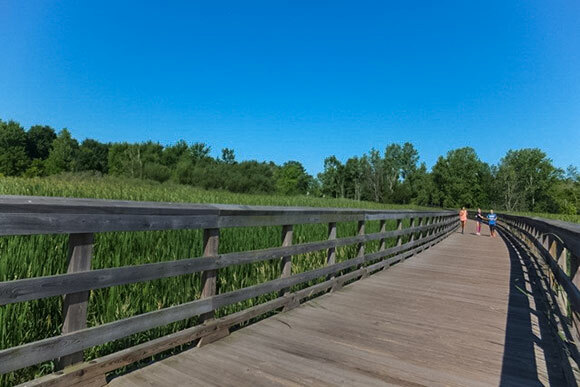 This trail also features stationary observation viewers to facilitate an up-close look at the surrounding wetlands. And don't be surprised to see a host of scrub-clad individuals on the trail. Not to fear, there is no emergency, they're just employees from Southwest General Hospital, which is adjacent to the trail, taking in some nature during their lunch break. Located just to the south of the quaint Bedford Commons Historic District along Broadway Road, Viaduct Park is a glittering northeast Ohio jewel that's worthy of the drive and then some. Its shady paths and steps meander around the Tinker's Creek Gorge, which features cooling falls and dramatic rock formations. This section of the waterway is also home to a host of architectural relics that date back to the early 1800's. 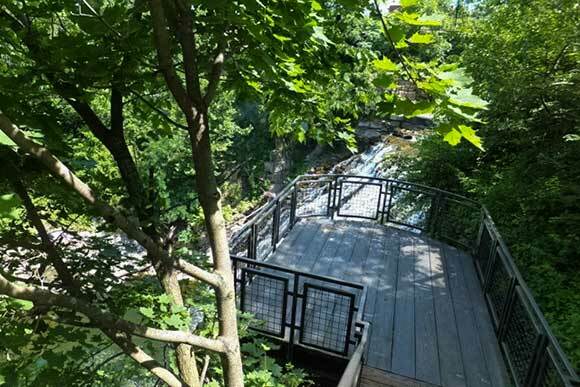 Explorers are free to prowl around an 1825 millrace (and even creep through it to a platform on the gorge wall), view the area from a 120-foot-high railroad viaduct that dates back to 1864, step down to the creek's edge and marvel over the 40-foot wide stone arch that controlled the water's flow in 1901, or search amongst the inviting foliage for remnants of the sandstone dam and saw and grist mills, all of which date back to the 1800's. "It's a great place for that history, that walk back in time," says Fetzer of the all but hidden park. Spanning between the intersection of Scranton and Carter Roads (adjacent to the green Eagle Street lift bridge) to the recently reopened Columbus Road Bridge, this approximately ¾ mile stretch in Scranton Flats includes unparalleled views of the city and a completely fresh perspective on one of Cleveland's oldest and most historic parts of town. Ducks on the Cuyahoga? We've got that, along with lush foliage and a stalwart observation pier from which to take it all in. Two pedestrian bridges, which traverse Scranton Road and a railway, give bikers and those on foot access to a heretofore hidden corner of the city: a close underpass of the Hope Memorial Bridge and its resident Guardians of Traffic. When they arrive at Columbus Road, they can opt to cross the daunting Columbus Road Bridge and hop over to Rivergate Park or just explore the Flats on foot and take in how all those bridges frame gorgeous views of the city. 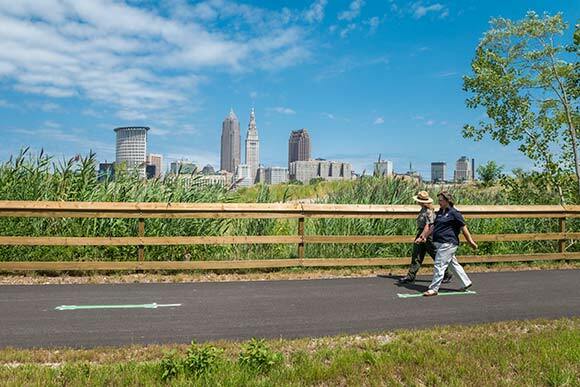 "It's about connecting the city with nature," says Jon Eckerle of Slow Roll Cleveland of the Scranton Flats and the associated Towpath project at large. "I think this is the most significant infrastructure project in northeast Ohio." 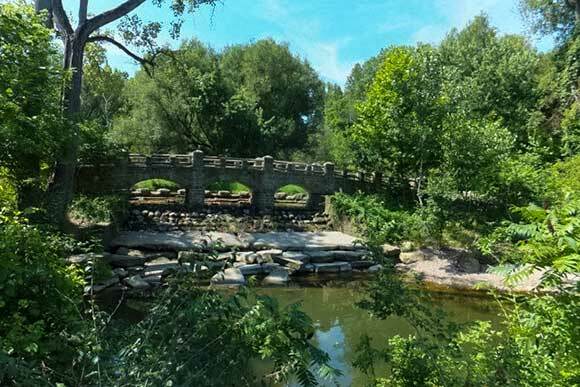 The popular Garfield Reservation is also home to an excellent example of Works Progress Administration (WPA) stonework, the Old Boating Pond Bridge, which was built in the late 1930s. Other stone remnants dating back to that era include parts of a dam and a staircase that led to the storied Iron Springs. "Back in the day, people believed that this water from the earth would cure all ailments," says Min Keung, manager of the Garfield Park Center for Urban Agriculture/Eco Explorers. "People would collect and drink it." Alas, the water of Iron Springs is no longer safe to drink. It's also difficult to find. "You'll just see some orange along the staircase," says Keung of the spring's iron residue. This urban park was inspired by the work of Frederick Law Olmsted, who designed New York's Central Park. It has a fascinating history and some intriguing visitors. "There are some really rare amazing birds in this park," says Keung, noting that a rare Redwing Crossbill traveled through in March, providing one of just a handful of sightings in Ohio. "Birders from all over came to see this bird." Keung describes the park as a natural rest area for our feathered friends as it is nestled amid otherwise dense urban terrain, "It’s a stop over," she says, "a little green oasis." "In this little nook off the beaten path, there's this really neat little trail," tempts Valerie Fetzer. She's referring to the two-mile Quarry Trail Loop in the Bradley Woods Reservation. The level earthen trail is rugged and dotted with the imprints of horse hooves and bike tire tracks. It traverses through a wood so dense, hikers will feel as though they've entered Jurassic Park. Insect repellent is a must. The park is unique as it is the only swamp forest within the Metropark system. "It's an area that was never developed. They couldn't; it was too wet. It was always green space," says Fetzer, adding that this chunk of green turf, the largest of its kind between Cleveland and Detroit, once served as a marker for commercial aviation pilots. "They were able to orient themselves looking for that stand of woods because it was always there," she says. Back in the mid-1900's Bradley Woods was also the site of a quarry operation, remnants of which remain, although the thick summer foliage makes them difficult to spot. "There are about nine quarry pits that are now filled with water," says Fetzer. "Some start to dry up, some will stay wet all summer." 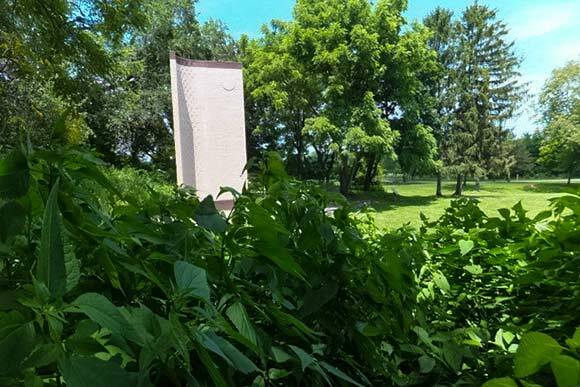 The Stinchcomb-Groth Memorial site sits high above the vast Rocky River Reservation. It features ample parking, an open grassy area, a paved, level 0.3-mile trail and memorials for the founder of the Metroparks, William Stinchcomb and Harold Groth, who succeeded him in 1957. The site is also home to a free summer concert series during the month of July. While it has no quirky paths, adventure courses or mysterious relics from our past, it's the perfect spot for an early evening picnic. After you've finished your fried chicken, pour another cup of iced tea, lay back on this patch of green that's dedicated to the man who, nearly 100 years ago, envisioned a meandering emerald necklace circling throughout northeast Ohio and marvel over how it has come to fruition in such an enduring way. Save for the Go Ape! treetop adventure course, all of these activities are free.